MACOMs BOO and BSP Series Capacitors are designed to facilitate bread-boarding or to use where a trimming capability is required. These devices feature the same dielectric layer and bonding surfaces as our 9000 and 9100 Series chip capacitors. By connecting the pads in parallel, the capacitance values are add tive, so many combinations are possible. 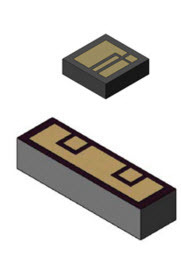 The BSP-1 chip offers the same capacitance values as BOO and BSP-3, but in a slightly larger chip with a more accommodating layout for ease of bonding.